The set for a clean, smooth, and moisturized face! 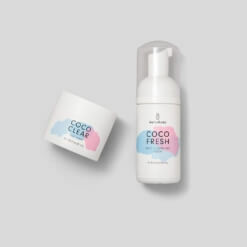 Our creamy COCO FRESH cleansing foam provides clean and fresh skin, while our COCO PURE coffee scrub gently exfoliates your face. 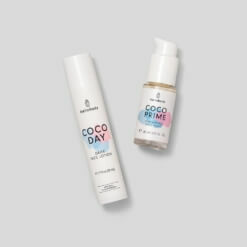 Our COCO DAY daily face moisturizer, and our multitasking COCO PRIME shimmering face fluid will offer you a deep moisture, and make you glow throughout the day. Treat yourself! Discover the benefits of this super set, and how to create the perfect face routine for you! Smooth cleansing foam that gently removes impurities, excess oil and daily makeup. For an even complexion and smooth skin! Glycerine: helps plump and repair the skin. Moor extract: cleanses the skin. Exfoliate and regenerate your skin with our creamy face scrub that contains naturally exfoliating coffee grounds and walnut shells. Sweet almond oil: preserves the moisture of the skin. Coconut oil: moisturizing and smoothing properties. This shimmering products is both a foundation primer and highlighter for longer-lasting make-up. Give yourself an extra dose of glamour! Organic coconut oil: moisturizing and smoothing properties. Organic Licorice Root Extract: prevents skin irritation. Organic Rayolis: reduces skin pigmentation. 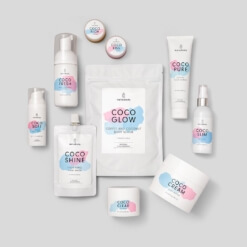 Step 1: Wash your face with our COCO FRESH morning and evening. Place a small amount of our foam in your hand, then apply to wet skin. Massage your face and rinse with warm water. 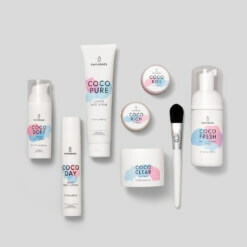 Step 2: Exfoliate your skin with our COCO PURE. Apply a small amount of this creamy scrub to moist skin and massage gently in circular motions. Rinse thoroughly with cold water. Do not leave on your face for more than 15-30 seconds. 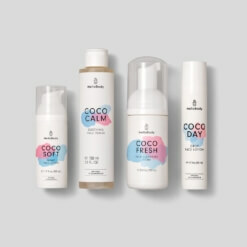 Step 3: Moisturize your skin with our COCO DAY, and enjoy a radiant complexion thanks to our COCO PRIME. Use our daily face cream to deeply moisturize your skin, and finish your routine by applying the COCO PRIME. You can use it as a primer or highlighter, your choice! In love with this set ? Write us your comment!